After the sensational debut album of Dream Evil, I have the pleasure to tell you about a new band making some noise on the true metal scene. Stefan Elmgren's Full Strike hail from Sweden playing true metal and draw natural comparisons to Hammerfall, who helped resurrect the true metal scene with their own debut album in the mid 1990's. After about ten seconds into the first song, the listener is well aware that We Will Rise is an album full of fist pumping anthems. Thundering double bass, driving riffs, clean vocals (but not too high pitched or squealing), and catchy melodies are in store for the listener. Aside from one ballad (Silent Screams) and one instrumental track (First Strike), We Will Rise is a well balanced album that mixes powerful yet catchy songs like End Of Time, Metal Mind, and Created Fantasy with mid tempo numbers such as Enlighten Me?, We Will Rise, and Master of My Soul. No matter the tempo, Full Strike serve up an album of songs the will immediately embed themselves into your mind. There is simply not a filler or "throwaway" track on this album. Even Silent Screams, the lone ballad of the album is a majestic and very memorable cut that avoids the high level of "cheese" found in many true metal ballads through the years. As for the musicianship, I can't find anything to complain about. The vocals are typical of most true metal acts, but there are no instances of a too high pitched delivery that enter the screechy, annoying range. Instead, the Niclas Johnsson's delivery is emotional and melodic in nature, but shows necessary restraint (and a very slight accent) as well. The rhythm section is steady and the listener is treated to a nice dose of riffing and ripping solos and shred work from beginning to end. 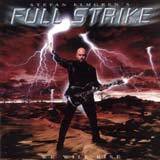 Stefan Ellmgren does a great job showcasing his guitar talents on this album. He does not ruin the integrity of the songs with over indulging in solos and shredding however. Simply put, this album is a must buy for the true metal fans out there. If you've already checked out the new Dream Evil disc and liked what you heard, I now recommend that you discover Full Strike. Of course, fans of Hammerfall should take a look at this album as well. This is a quality true metal album that sees yet another Swedish band put itself on the map. Congratulations on a fine debut!